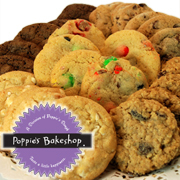 Poppie's Cookies come from the life's baking work of a man lovingly known as Poppie to his family and friends. Using quality ingredients, his made-from-scratch baked goods resulted in expertly crafted and familiar favorites. Five delicious flavors available in 3oz boxes and 8oz canisters.